Thank you Apothemary for nominating me as one of nine in this quote challenge. I am honored. 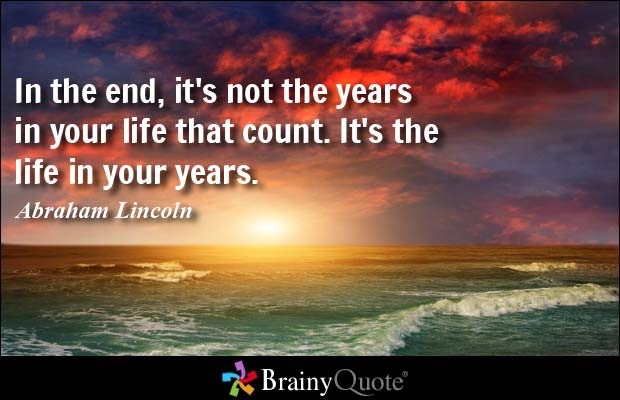 Live life to the fullest is what President Lincoln was getting at, at least in my humble opinion. Are there things in your life getting in the way of living your life in the years you have? This quote always challenges me to evaluate my priorities. To be honest, I’ve gotten a blur left of center but am working my way back. One step at a time. how about you? Have you found things that help keep you in track? I’d love to hear what works for you…and what hasn’t (and why). Looking forward to seeing what quotes inspire, speak, teach, remind, and focus you! As always, see you on the pavement! Lovely one to start with! Congrats !